Ohio Governor Mike DeWine reading to the first grade students. Ohio Governor Mike DeWine asking the students if they rode a school bus and that his grandchildren ride a bus. First grade students from Minford with Ohio Governor Mike DeWine during kindness week. Front Row: students, Back Row: Principal Ryan McGraw, DeWine, and teachers. 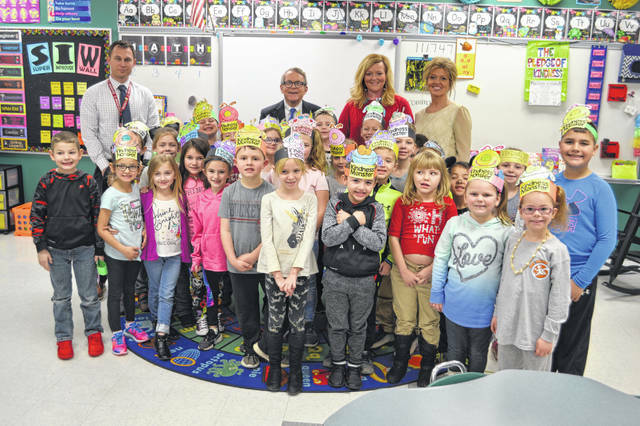 The students at Minford Elementary School had a special visitor, when Ohio Governor Mike DeWine visited the school to share kindness week with them. The kindness week for the elementary school students was the brainchild of the new Social Emotional learning teacher Kendra Cram. DeWine came to visit, to be part of this celebration of kindness week. Principal Ryan McGraw met the governor at the door and they immediately began talking about what McGraw said was so important to their school this year and that was the social and emotional well being of the students. McGraw said instead of being reactive with problems that may come up, they want to be proactive. 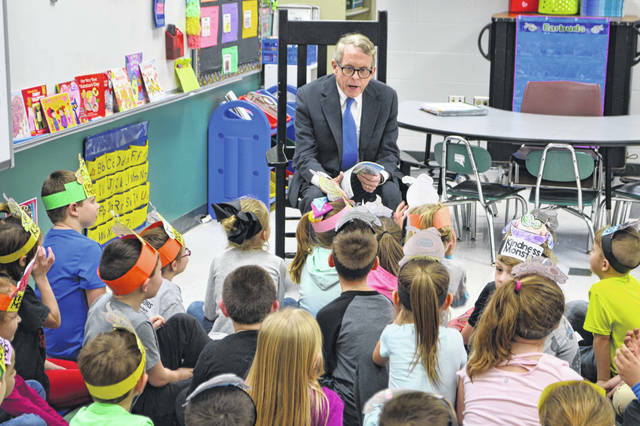 He told DeWine that they now have a social and emotional class for their kindergarten and first-grade classes and they have already seen many positive things come from that class. McGraw said, “The goal is to extend it to the second and third grade next year, provided there is the funding,” which got a laugh from DeWine and the small crowd in the hallway. DeWine was then led by McGraw through the hallways of the elementary, where all the second-grade teachers stood outside their classroom doors. DeWine did not dare pass by without stopping to speak to them and then asked them some questions, one of them being what they saw as one of their biggest challenges and was very attentive to their answers. Janice Taylor, gave DeWine a bag with some new cookbooks, to give to his wife, Frances, who Taylor said loves to cook and collects cookbooks. 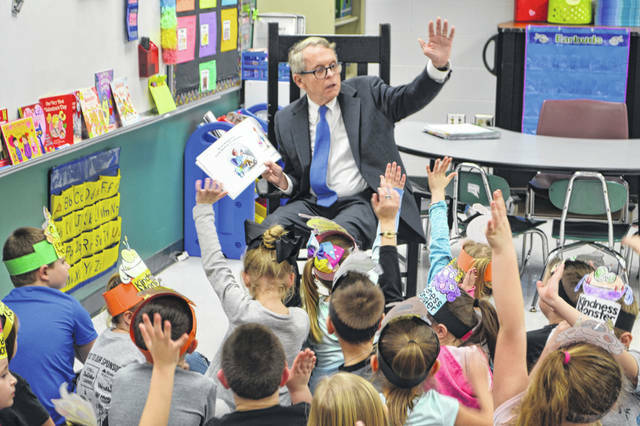 DeWine was then led to the first-grade hallway and into one of the classes so he could read to the children. As soon as he got in the classroom, he noticed that the kids had kindness hats on and he immediately asked them about the hats. And he and the children talked about the ‘kindness monster’. DeWine chose the book, “Have You Filled a Bucket Today? This book encourages positive behavior by using the concept of an invisible bucket to show how easy and rewarding it is to express kindness, appreciation, and love by ‘filling buckets, which he chose to go along with the kindness week theme. The governor told the children that he has 24 grandchildren, which seemed to impress them. DeWine said he came to Minford because he got an invitation and he was going to be in this part of the state (he was at Shawnee State University) and it seemed like a good opportunity to stop by. Look for Part II of this story in tomorrow’s Daily Times, that will focus on all the things planned and implemented into Minford Elementary’s Kindness Week.